We’d love your help. Let us know what’s wrong with this preview of Balderdash! by Michelle Markel. To ask other readers questions about Balderdash!, please sign up. Be the first to ask a question about Balderdash! This charming picture book for children and adults tells the story of how children's literature came to be and why. In the days of powdered wigs and hoop skirts books were for the wealthy. They were boring and hard for children to read. Books aimed at children told children how to behave and what to do. John Newbery rejected that. He thought children's books should be entertaining tales. He became a printer, editor and possibly author of fairy tales and fun folk tales for children. The History o This charming picture book for children and adults tells the story of how children's literature came to be and why. In the days of powdered wigs and hoop skirts books were for the wealthy. They were boring and hard for children to read. Books aimed at children told children how to behave and what to do. John Newbery rejected that. He thought children's books should be entertaining tales. He became a printer, editor and possibly author of fairy tales and fun folk tales for children. The History of Little Goody Two-Shoes is one of his most famous books. While his stories often taught lessons, the lessons were subtle and more entertaining. They were also affordable for children and enormously popular. The prose of this little biography is peppy and peppered with exclamation points. The knowledge is imparted in a lively and fun manner just like Newbery's books. The sentences are short and simple so children can read the text themselves. In the back of the book is a historical note for adults and a bibliography. An interesting look at the man behind the medal! I think when you look at what the award is given for - most distinguished contribution to children's literature - readers will be able to compare to Newbery's own contributions during his lifetime. I know how our Mock Newbery Club will begin its first meeting every year! Lihat sampul buku ini langsung jatuh cinta. Judulnya menarik, tapi yang lebih menarik sub judulnya. Ow, ternyata ini biografi John Newbery, yang namanya digunakan sebagai nama penghargaan (Newberry Medal). Newbery Medal adalah salah satu penghargaan prestisius untuk buku anak. Saat penerbit Mizan (melalui Kaifa dan DAR!) menerbitkan buku-buku yang mendapat Newbery Medal di awal tahun 2000an, saya mengoleksi hampir semua judul. Buku bergambar ini mengisahkan jatuh bangun John Newbery menerbitkan Lihat sampul buku ini langsung jatuh cinta. Judulnya menarik, tapi yang lebih menarik sub judulnya. Ow, ternyata ini biografi John Newbery, yang namanya digunakan sebagai nama penghargaan (Newberry Medal). Newbery Medal adalah salah satu penghargaan prestisius untuk buku anak. Saat penerbit Mizan (melalui Kaifa dan DAR!) menerbitkan buku-buku yang mendapat Newbery Medal di awal tahun 2000an, saya mengoleksi hampir semua judul. Buku bergambar ini mengisahkan jatuh bangun John Newbery menerbitkan buku-buku anak. Kala itu (abad ke-18) buku sangat populer di Inggris, terutama di London, tapi kebanyakan buku ditujukan untuk orang dewasa. Kalaupun ada buku untuk anak, tapi cerita dan kemasannya tidak “anak-anak”, alias nggak asyik. John Newbery pun mulai menerbitkan buku-buku anak yang atraktif. Kisah-kisah fantasi, cerita-cerita dongeng yang lucu. Kadang dilengkapi permainan, juga mainan. Semua buku yang diterbitkan awalnya anonim, kadang hanya dibubuhi kalimat “you know who” sebagai nama penulis (kok jadi inget Voldemort ya? :D). Newbery pun mulai mendapat tempat di hati anak-anak. Buku-buku yang ia terbitkan banyak disukai. Newbery meluaskan penerbitannya, dengan membuat buku untuk anak-anak yang lebih tua. Ia membuat buku tentang aritmatika, geografi, astronomi, dan lain-lain, tentu… dengan cerita dan kemasan yang menarik. Literasi untuk anak-anak pun makin berkembang. Wajar, Newbery dijuluki sebagai The Father of Children Literature, dan namanya diabadikan oleh ALA (American Library Association) sebagai nama penghargaan untuk buku anak-anak yang dianugerahkan setiap tahun. “The Grand design in the nurture children in to make children strong, hardy, healthy, virtuous, wise, and happy,” begitu prinsip John Newbery. This rollicking and fascinating picture book biography chronicles the life of the first pioneer of children’s books—John Newbery himself. While most children’s books in the 18th century contained lessons and rules, John Newbery imagined them overflowing with entertaining stories, science, and . . .
~The illustrations, paper choice, font changes, and of course the powder wigs put readers in 18th century England. ~I like the exuberance of the English readers and all of the imagination and creativity that went into their books—but not for kids. ~A publisher’s apprentice finally opens his own store and publishes his own books. But this guy, he thinks kids need fun stories, just like the adults. He even published a kid’s magazine for the same reason. ~You may know his name—John Newbery—thanks to an award in . . .
Could a librarian possibly NOT give this book 5 stars? It's the story of John Newbery and how he championed the writing and publishing of children's books in the mid 1700s in England. I don't think that kids will readily pick this up and read it---even though it is in engaging picture book format. It's another one of those children's books that adults will probably enjoy more than children. This will be a great book to kick off our Mock Newbery. The illustrations were great but I really liked the variation of fonts throughout. I know, weird. Good into to Newbery and his philosophy of children's books. Fun design, great illustrations, but I'm just not sure it connects enough to today's young readers. Bonus points to this history book for showing people of color in its pages, unlike so many other history and historical fiction books that seem to assume there were no POCs until the 1900s. What better day to look at a book about John Newbery than today, the day when the 2018 Newbery Award is announced, along with all the other ALA Youth Media Awards. And while most people know about the Newbery Award, few know about the man it is named for. No need to wonder any more - Balderdash! tells the story of John Newbery and his novel idea of publishing books for young readers that they would want to read. Way back when, that is, before 1726, children had only preachy poems and fables or re What better day to look at a book about John Newbery than today, the day when the 2018 Newbery Award is announced, along with all the other ALA Youth Media Awards. And while most people know about the Newbery Award, few know about the man it is named for. No need to wonder any more - Balderdash! tells the story of John Newbery and his novel idea of publishing books for young readers that they would want to read. Putting his ideas into practice, Newbery first learned the printing business and then, as soon as he could, he set off for London, opening his own print shop in the heart of St. Paul's Churchyard. It was here that Newbery begin publishing books for young readers, enticing them to want to read books like The History of Little Goody Two-Shoes, Tom Thumb and Giles Gingerbread by selling them with an accompanying ball or pincushion. Of course, there were also ABC books, science books, history books and geography books, but the kids loved the books that Newbery published and sold so much, they fell apart from use. Pretty soon, other publishers followed Newbery's example and began to publish children's books as well. Markel has written a wonderful, engaging book that really captures all the enthusiasm that Newbery must have felt when he began his career in children's book publishing. The text is fun and lighthearted, but provides readers with a clear picture of what life was like in the early 1700s, particularly for children. One thing does need to be taken into consideration when reading this book - books were only bought by people with money and not everyone went to school and learned to read. Also, the books Newbery published back then probably wouldn't appeal to today's readers very much. Carpenter's mixed-media illustrations only add to the enjoyment of the text, extending and enhancing it with the same lighthearted attitude, and at the same time, both reflect the passion John Newbery felt about his work. And I can almost guarantee that once your young readers learn the meaning of Balderdash! you will be hearing it frequently - I know I did (hint - look on the front jacket flap). Markel has also included lots of useful back matter for further exploration about the life of John Newbery, and children's book publishing. Balderdash! is a book that should be on the shelf of every children's home and/or school library. It's just that good. First sentence: Welcome! This book's for you. Every page, every picture, every word, and even its letters are designed for your pleasure. Lucky, lucky reader. Be glad it's not 1726. 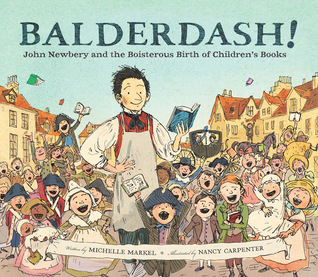 Premise/plot: Balderdash is the story of the origins of children's book publishing. It is the story of one man in particular, John Newbery, and his contribution to the world. And it is a BIG contribution to be sure. The narrative begins by taking readers back to a time when books were decidedly NOT for children. "In t First sentence: Welcome! This book's for you. Every page, every picture, every word, and even its letters are designed for your pleasure. Lucky, lucky reader. Be glad it's not 1726. John Newbery was a boy who LOVED reading who grew up to be a publisher. He wanted to publish books for the WHOLE family including children. SHOCKER. Books written and published specifically for children to READ AND ENJOY! If that wasn't shocking enough. He marketed his books to sell with TOYS. ("Price of book alone, 6 pence, with a ball or pincushion, 8 pence...") He soon expanded to publishing magazines for children. His ideas were novel and wonderful! Can you imagine a world without children's books?! My thoughts: I LOVED this one. I LOVED, LOVED, LOVED it. I found it fascinating and packed with detail. I was not completely unfamiliar with the history of children's literature. In fact, one of my favorite graduate courses was the history of children's literature. There was a huge difference between the before and after. If you weren't thankful for children's books before the course, you certainly would be afterwards. It was a great way to celebrate PROGRESS. The same is true of reading this picture book. IT reminds us of where we've been and how far we've come. It celebrates the legacy of one man's contribution, but it also celebrates READING in general. 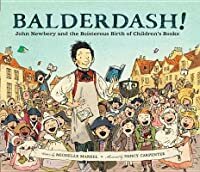 This picture book biography is the story of John Newbery, the man who first created books for children in the 18th century. Books were popular in London at the time, but all of the fun books were for adults. Children had to read poems and fables that were dull and taught them about social niceties. John Newbery grew up to be a publisher and realized that children needed different books. He created a book that was filled with fantasy and games and then he made it very attractive and paired it wit This picture book biography is the story of John Newbery, the man who first created books for children in the 18th century. Books were popular in London at the time, but all of the fun books were for adults. Children had to read poems and fables that were dull and taught them about social niceties. John Newbery grew up to be a publisher and realized that children needed different books. He created a book that was filled with fantasy and games and then he made it very attractive and paired it with a toy. Next came a magazine for children and eventually a novel. The books were written anonymously but all were sold and printed by Newbery himself, the man who created children’s literature. Markel has captured the feel of the creativity and wildness of someone who decided to make a major change in the world. The text here is celebratory of the new discoveries and new chances being taken in books. Markel points out all of the positives about Newbery’s book and avoids noting that his books don’t bear any resemblance to children’s books of today. Rather, the focus is on the invention, the cleverness of the marketing and the popularity of children’s books from the very beginning. Carpenter’s illustrations are filled with pizzazz. They have a great energy about them, depicting the bustling streets of London, the desirability of the books, and even showing sad children with real humor. She uses slightly turned pages to show other images underneath along with speech bubbles. The text of the book is also playful, moving through different fonts and text sizes for emphasis. It was great to read about the person who inspired one of the most prestigious awards in children's literature. As a publisher, a bookseller, an author, and a clever marketer, John Newbery became an early pioneer in making children's books things that kids would actually want to read. A fascinating story paired with lively illustrations and packed with lots of back matter information. Book lovers- particularly those in the kidlit community- will enjoy this and want to add this to their collection. This adorable book tells the story of John Newbery and the beginning of picture books with quirky illustrations and simple text. Though it's a biography, it is everything a biography in picture book format should be: cute, fun, easy to understand, engaging, and it tells a story children should know. And not just children - adults should know this one, too. I mean, have you ever wondered where the Newbery Award comes from? I would definitely use this for storytime. Loved this! What a unique book! Lovely book. Gives background of evolution of children's reading books. Illustrations lovely also. Cute kids' bio of children's lit pioneer John Newbery (1713-1767), who the Newbery Medal is named for. A slam dunk to get in most children't libraries. An excellent case made that reading for children should be a celebration. I will definitely be reading this to introduce Mock Newbery this year! 5 stars to design and enthusiasm - I loved the paper quality, the different typefaces, and the illustration styles. The content is a little bit harder for me to rate. A very good introduction to the idea that children's books haven't always existed and a wonderful tribute to those who believed in kid lit, but I feel that some of the technical terms and other vocabulary might be out of reach for some younger readers. High hopes for this one, but it didn't quite connect with me. Full review can be found at booksmykidsread.wordpress.com. Balderdash! is a great biography about a man whose name is synonymous with children’s literature. The cover of the book even has such a wonderful illustration by Nancy Carpenter that the book screams out to be read. But even with Newbery being such an important name in children’s literature, I admit that I didn’t know much about him before reading this book. Given the amount of children’s literature I read, I can’t fathom a time when there Full review can be found at booksmykidsread.wordpress.com. Given the amount of children’s literature I read, I can’t fathom a time when there weren’t books written for kids. But as this book aptly describes, in the early 1700s that was not the case. Children were not wanted in bookstores or libraries. Between Markel’s engaging text and Carpenter’s comical and vibrant illustrations, kids can really get a sense of the difference. The few books children were told to read in school were “religious texts that made them fear that death was near, and manuals that told them” how to do everything. When John Newbery gets introduced into the book, you can’t help but like him. In a time where so many adults were reading for pleasure, it is astonishing that no one else had tapped into the niche market of children. Some 20 years earlier, philosopher John Locke had written about the need for children to have “easy and pleasant books” as part of their education, but few had agreed with him. Thankfully for all of us kid lit bloggers, Newbery created books specifically for children that were irresistible, fun, and educational. They were also pocket sized so the kids could take them with them wherever they went. We all owe a debt of gratitude to the “father of children’s literature” – John Newbery. I adored this book. I admit that children’s book bloggers are probably biased about this one since it touches on all of our sweet spots – great story, wonderful illustrations, engaging, and a book about books! But this is also one of those great biographies for children to read because it talks of someone going against the norm to follow a passion. John Newbery loved books. He loved them at an early age, there just weren’t any around that were intended for him. So when he got old enough that he could make a difference, he did. He also created the first magazine for children. Hello, friends! 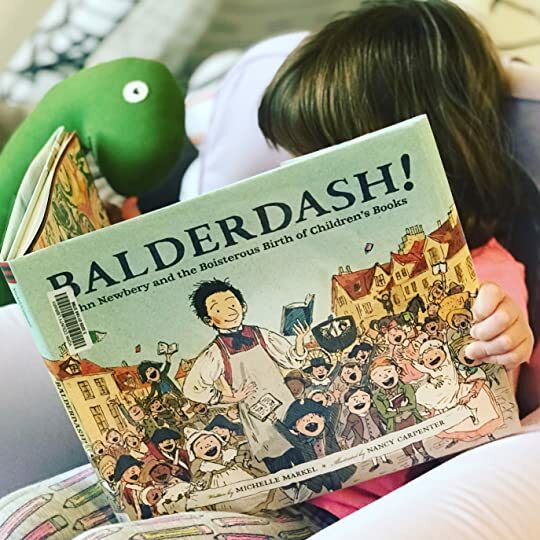 Today, we’re reading Balderdash! : John Newbery And The Boisterous Birth Of Children’s Books, written by Michelle Markel and illustrated by Nancy Carpenter, the story of the famous publisher and his dream to bring a new genre of literature to life. Back in 18th century, when John Newbery was just a lad, there were no books for children – well, except for dry school texts and ominous religious parables. It was thought that children shouldn’t read for pleasure because it might make them unruly and mischievous. John – who grew up loving books and learned to print and publish his own materials under his own company – disagreed. He believed that children deserved stories, magazines, novels and nonfiction books that entertained as much as they instructed. So he began printing children’s stories, assembling his own anthology for little ones called A Little Pretty Pocket-Book, filled with games, stories, and lessons. The children of London went wild for it, and it eventually became a best-seller in England and the US. Newbery went on to publish more books and periodicals just for little ones, pioneering a genre that still brings joy to baby bookworms today. This one was right up our alley, and we ADORED it! The story celebrates Newbery’s belief in children’s literature as well as the concept of kidlit itself, recognizing that children have always been passionate about reading, and detailing Newbery’s devotion to bringing the power of words and stories to that audience. The pace is fantastic; where kidlit biographies can sometimes be tedious, this one moves briskly while using creative typeset and detailed, whimsical illustrations to keep little readers engaged. The length is great, and JJ and I both loved learning about this visionary publisher. A fun and informative true story, and it’s Baby Bookworm approved! I had a hard time deciding on this one for only one reason. The story itself is totally fine- interesting, informative, engaging. Pretty illustrations and fun typography and page design. But. *Almost* every face (and there's A LOT of faces) is white. On the one hand, this is historically set during a time of slavery, so excuses could be made. On the other hand (and more importantly, heart and mind), who cares? It's a kids book filled with illustrated inaccuracies technically (I doubt a ton of I had a hard time deciding on this one for only one reason. The story itself is totally fine- interesting, informative, engaging. Pretty illustrations and fun typography and page design. But. *Almost* every face (and there's A LOT of faces) is white. On the one hand, this is historically set during a time of slavery, so excuses could be made. On the other hand (and more importantly, heart and mind), who cares? It's a kids book filled with illustrated inaccuracies technically (I doubt a ton of kids hung out by themselves tableau-style with this guy in the streets). And, what, you want your picture books filled with black children portrayed as slaves? No? So instead you chop them out all together? Is that really such an improvement? I doubt the intention of the illustrator (and the rest of the team that okayed this) was bad. They probably just didn't notice. Didn't even notice. But at the end of the day, the effect trumps the intent. This book is supposed to tell the story of how picture books came to be. How Newbery thought all kids should have fun stories to enjoy! But I guess what he meant was just white kids. When I picture a kid today sitting on the floor flipping through this book and seeing so, so many pale little faces staring out at them paired with words like "all children"... it kind of makes me want to scream at someone. That stuff gets internalized, people. And, yes, barring that, the story is pretty great, but I figure if I'm going to make an effort to stand up for the importance of diversity, I don't get to pick and choose when I do it. The line is not moveable, nor is it really that fuzzy. We just have to be aware of what we're looking for, and keep looking, and keep listening, and keep learning. This book was about John Newbery (also known as the "Father of Children's Literacy") and how he changed children's literature in the 1700's. The book talks about how he opened a store full of children's books and the children wanted to read them so badly! The pictures show children in the streets with his books. This is because his books were fun to read. They were about stories, science, games, and fun. This is a biography of Newbery and how he felt that children's books should be full of wonde This book was about John Newbery (also known as the "Father of Children's Literacy") and how he changed children's literature in the 1700's. The book talks about how he opened a store full of children's books and the children wanted to read them so badly! The pictures show children in the streets with his books. This is because his books were fun to read. They were about stories, science, games, and fun. This is a biography of Newbery and how he felt that children's books should be full of wonder and adventure, not facts and adult type things! This story takes us through just how popular his books became amongst the children. This book was so much fun to listen to! The pictures were really detailed and went well with the story. I felt that without them, the story wouldn't have been as interesting. The story itself is an excellent biography of Newbery. It explains his life very well, but keeps it interesting for children. Usually when we hear the word "biography", we think boring. This book was far from it. In 2013, Leonard S. Marcus wrote a picturebook about Randolph Caldecott (published by Farrar Straus and Giroux) using Caldecott’s own illustrations to tell his story. As a member of the 2015 Newbery Award Committee, it should surprise no one that I would jump for joy when seeing a picturebook about John Newbery that serves as a complimentary piece. England in 1726 was “brimming with books. Books about pirates and monsters and miniature people. Tales of travels and quests and shipwrecks and crime In 2013, Leonard S. Marcus wrote a picturebook about Randolph Caldecott (published by Farrar Straus and Giroux) using Caldecott’s own illustrations to tell his story. As a member of the 2015 Newbery Award Committee, it should surprise no one that I would jump for joy when seeing a picturebook about John Newbery that serves as a complimentary piece. John Newbery grew up on a farm and loved to read, so he apprenticed himself to a publisher and as soon as he was able, he moved to London and opened his own shop. Because Newbery liked children, he wanted to share books they would enjoy and published his first book for children – which included a toy ball or pincushion. Children loved it! He became a very successful publisher of picturebooks, novels and non-fiction exclusively for children, so is now considered to be the Father of Children’s Literature. Pen and ink artwork by Carpenter is digitally enhanced and bring to life the whimsy of this time period. What better way to start a unit about Newbery Medal books than to read about the man behind the medal? For all grades.